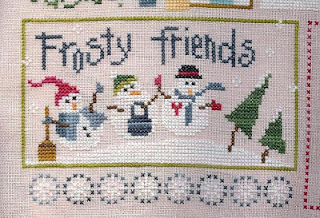 are done just in time for our cold weather....I hear we had some flurries(that melted) Monday night but it was dark out and I wasn't watching for them. Here is/are Lizzie Kate Snow Belles on For the cure (pink) fabric. The piece is just draped for picture taking and not stretched so is a bit askew. I put a piece of white behind it but it still doesn't show pink enough in the photo. Now I'm back to stitching on my Hands to Work sampler. 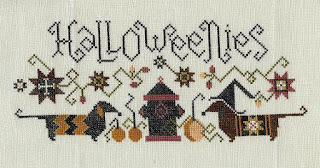 I also am closing up my set of Blackbird Designs Halloween stockings so hope to have those to show....they've been stitched for a year or two but I am just getting the finishing done on them(with my mom's help of setting them up for sewing together). 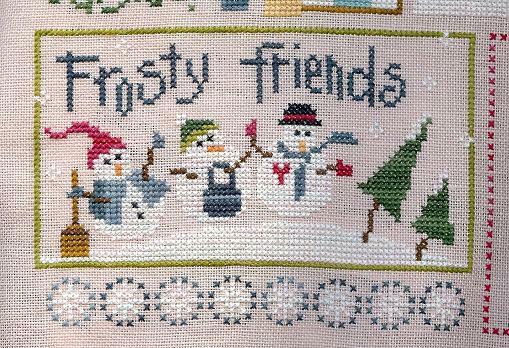 I've finished up Lizzie Kate's Snow Belles Frosty Friends and just have 1 more to go to have the whole piece finished. with some pictures finally. Seems like I am starting on and working on several things but not getting any finishes the last couple of weeks. Will probably get a few all at once this way though. Here is Ice Queen from LK Snow Belles that was finished over a week ago. I love the color(For the Cure) of this fabric but not caring for the 30ct open feel. But it will all be okay. And a friend lent me this chart that I was just itching to do. 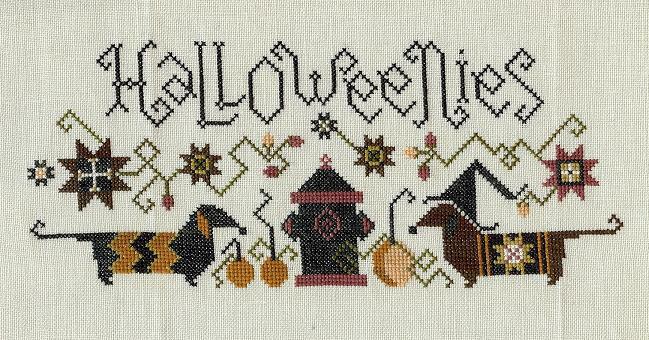 I didn't stitch much over the holiday but did get some x's in on Saturday evening.Plum Street Sampler Halloweenies. I did switch the color for the dog on the right. I didn't use any CC, but Weeks or GAST instead. Hope everyone's holiday was a good one. I'm popping on here to wish everyone a Happy Thanksgiving in the US....others, it's a great time to remember to be thankful for what you do have. I did have an LK Snowbelles finish last weekend but haven't gotten a scan yet....will do so after the holiday. 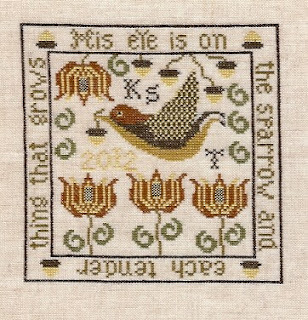 I have been working on a couple of things....One I ran out of SNC a week or so back so while waiting for a friend to bring it from Cecelia's retreat this weekend I worked on this Goode Huswife's The sparrow. It's on 40ct. linen over 2 with DMC. And just in case you were interested...this chart is spoken for. After finishing the Goode Huswife chart on Saurday I finished up a partial start on M Designs 'Katelyn'. It's on 40ct white over 2 using SNC Jellybean. Sunday was such a cold rainy day that it was a good movie day for DD & I with DH deer hunting. 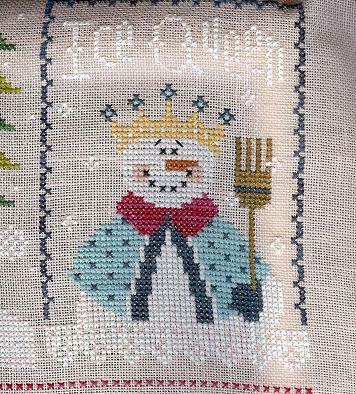 Needless to say, lots of stitching time on Sunday after church and lunch with family. This is Bent Creek's freebie 'One dozen'. It really was a quick stitch, only 4 DMC colors on 28 ct. natural linen. It's on a slant because it's a tad too long for the scanner. I've started a little PS ornament but I'm not into it...so it will probably be put aside(it's on dark fabric)to find something else to stitch while I wait to meet up with my pony express delivery of floss. I really need to sit down with my finishes and finish some of them up.....Have a box of frames a friend gave me & I need to make an inventory to see if any of them fit some of my finishes as is.